The bright ambiance and a great atmosphere guarantee a peaceful stay at Vitasol Park. 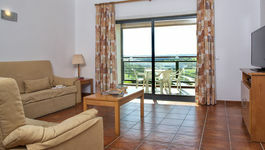 All apartments are self catering and are comfortably furnished and located in small blocks with lift. In addition to a modern and functional kitchen, even have air conditioning in the living room and bedrooms, safe, cable TV or satellite TV and bathroom with tub. These apartments are designed for comfort and convenience, thus making it the perfect place to rest after a fun day. You can also enjoy a furnished balcony overlooking the pool, the city of Lagos or the mountains. These apartments have 2 single beds, living room with sofa bed for two persons and a kitchen or kitchenette equipped with hob, oven, microwave, washing machine, refrigerator, extractor and kettle. These apartments have one bedroom with two single beds and the other with a double bed, two bathrooms, one with bath and the other with shower, living room with sofa bed for 2 persons and kitchen with hob, oven, microwave, washing machine, dishwasher, refrigerator, extractor and kettle. These apartments have 2 bedrooms with one double bed each, and another bedroom with a 2 single beds, two bathrooms, one with bath and the other with shower, living room with sofa bed for 2 persons, LCD and DVD, kitchen with oven, microwave, washing machine, dishwasher, refrigerator, extractor and kettle. These apartments have 2 bedrooms with 2 single beds each and the other 2 bedrooms with double beds. Two bathrooms, one with bath and the other with shower, living room with sofa bed for 2 persons, LCD and DVD, kitchen with stove, living oven, microwave, washing machine, dishwasher, refrigerator, extractor and kettle.